Tommy Flanagan started out his career as a Disc Jockey (DJ) before venturing into the acting world. Ever since then, he has gone ahead to star in a lot of movies as well as television series. 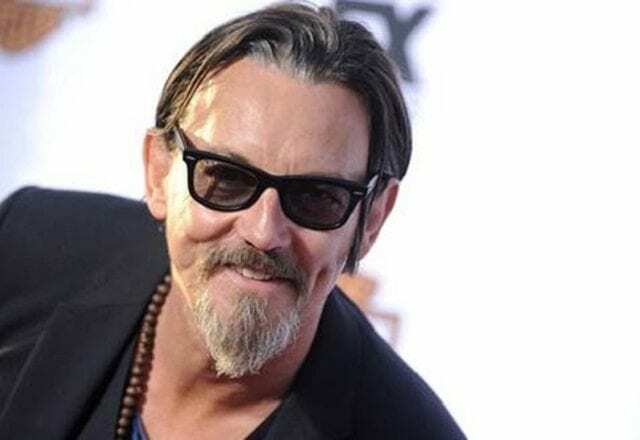 He is most popular for his role as Filip Chibs Telford on the Sons of Anarchy. Of a truth, it hasn’t been all rosy for the actor but he has pulled over all limitations and has built a successful career for himself. He has been married thrice and is a well-respected family man. There are plenty of more interesting facts to learn about him and you will learn more by reading the article. In a little town in Glasgow called, Easterhouse on the 3rd of July 1965, David Flanagan and Elizabeth Flanagan welcomed their son, Tommy Flanagan to the world. He was raised in Glasgow, alongside his brother, Andrew Flanagan and five other children. Not exactly a surprise for a Scottish, Tommy was raised a Catholic and spent his childhood days as an altar boy in the Catholic church. Life took an unexpected turn for Tommy when his father walked away from the family, leaving them without a patriarch to support the large family. This unfortunate turn of events bred trouble for the Flanagan children, with a couple of them, including Tommy himself getting into trouble while trying to live life the way he saw fit. A large family such as theirs struggled with money and Tommy, like the rest of his siblings, worked to support the family. Tommy especially took on odd jobs like painting, decoration, and becoming a DJ. There is no official information on Tommy’s education history, with little confirmation that he attended college. Perhaps if he had, he would not have become a DJ, which eventually led him to become an actor. His career as a DJ came to an abrupt stop when he was attacked by a couple of thugs who had a knife on him outside of a nightclub he worked as DJ. The scar from the attack is still very much noticeable on his face. After the attack, his friend, Robert Carlyle advised him to leave the profession and become an actor. Our enjoyment of his characters in films like Braveheart (1995), The Game (1997), Face Off (1997) is a result of him choosing to take that advice. After leaving the hospital, he joined Carlyle’s Raindog Theater Company, where he began to appear on stage. During his time as a stage actor, Tommy appeared in plays like Wasted I and II, Macbeth and One Flew Over the Cuckoo’s Nest. During three years working for theater, Tommy saw acting as a legitimate way to build the life he wanted and fell in love with the profession. He eventually, began to seek roles in onscreen productions and got his debut in an episode of Screen One in 1992. He further appeared in Tis the Season to be Jolly and Taggart. In 1995, he had his first appearance in a Hollywood project, appearing in Braveheart alongside Mel Gibson. Since then, Tommy Flanagan has appeared in several Hollywood films and television shows. The Game (1997), Gladiator (2000), Sin City (2005), Smokin’ Aces (2010), are just some of the major films Tommy Flanagan has appeared in over the years. In television, he got his most iconic role yet as Filip Chibs Telford on the Sons of Anarchy. He played the role for 90 episodes between 2008 and 2014. He has most recently been cast to play Alec McCullough in Wu Assassins; a 2019 project. His status as one of Hollywood’s biggest Scottish actors has earned him an ambassadorial role, such as being the spokesperson of Irn-Bru, a Scottish soft drink. Tommy has been married three times. At the first two times, neither of his marriages lasted five years. His first to Rachel Flanagan lasted for three years between 1998 and 2001 while the second to Jane Ford lasted from 2007 to 2010. His third marriage and the current one to Dina Flanagan has been since 2010 and it has produced a single daughter, Aunjanue whom they gave birth to in 2012. The couple currently lives in Malibu in California. Brown eyes and grey hair are some of Tommy Flanagan’s body features outside of his trademark scar. The Scottish actor also has a body height of 6 feet and weighs 78 kg.